It’s been a while since I shared any astrophotography, besides the moon. As such, I have kind of been looking forward to this blog entry, as I’ve been collecting imagery for it for quite some time. I spent most of the summer working on a major summer constellation: Cygnus. 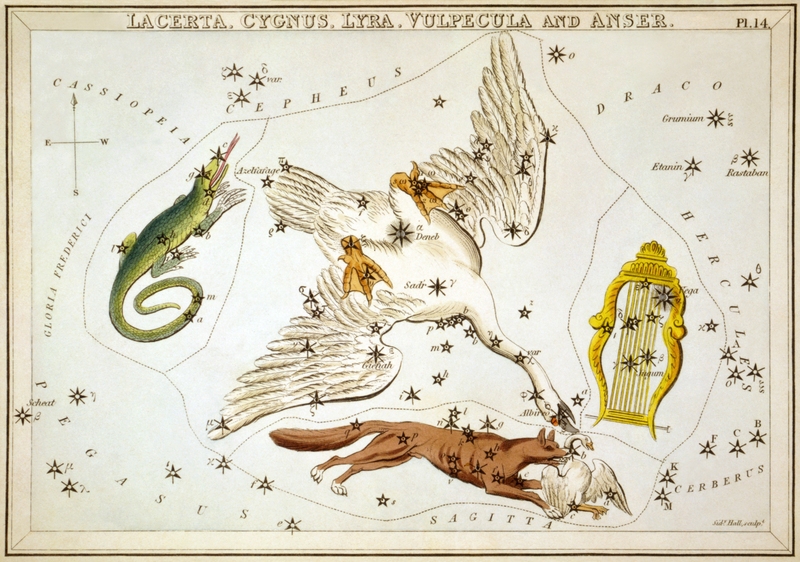 Cygnus, or “The Swan” as it is in the original Latinized Greek, is one of the most prominent constellations during summer. 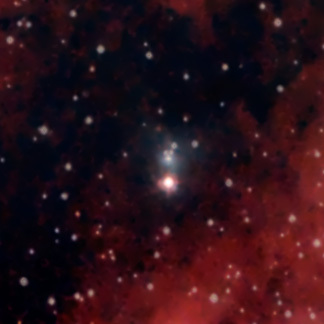 It is probably more commonly known as the Northern Cross, or just The Cross, given that part of the constellation, an “asterism” as they are called (much like The Big Dipper is an asterism of the constellation Ursa Major), looks like a big cross. The primary named stars of the constellation are Deneb, the brightest at the tail, Sadr at it’s heart, Gienah on a wing, and Albireo at the head. 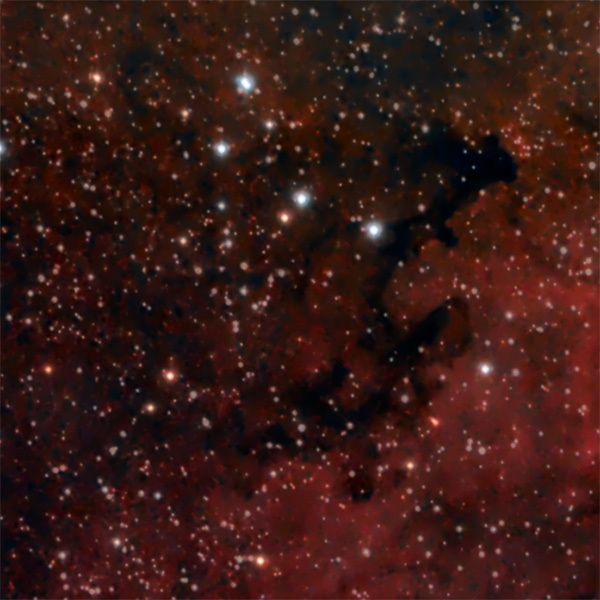 There are a total of ten primary stars that make up the full shape of the swan and it’s wings, as well as countless other stars, emission nebula, dust lanes and dark nebula, reflection nebula, star clusters and more in the region. The region itself is part of the Milky Way, our home galaxy. Cygnus sits about half way between the core of our galaxy, which from the northern hemisphere sits directly in the southern sky during the summer months, and the outer reaches of our arm of the galaxy, which stretches through Cassiopeia, Perseus, and a few other constellations near the north pole. While not as bright as the galactic core, as it does not represent nearly the same star density, Cygnus is home to one of our large, rich hydrogen regions. Large expanses of hydrogen emission nebula, long stretches of dust, star clusters and amazing planetary nebula and supernova remnants stretch all throughout the arms of our galaxy. While within the city, polluted by ever increasing amounts of light (light pollution, as it reflects off of atmospheric particular), the great expanse and beauty of Cygnus can not be recognized, if you are lucky enough to live under dark, rural skies away from the expanses of city or suburban life, you may have the opportunity to see the more than just the stars within Cygnus…you may be able to glimps the faint beginnings of some of the amazing regions I’ll be sharing with you here. 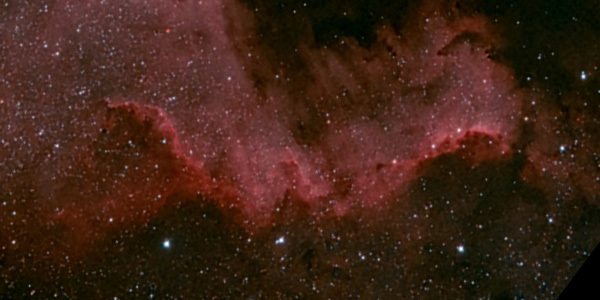 At my altitude (latitude), the heart of Cygnus, the region of molecular clouds around the star Sadr, passes directly overhead. This point is called the Zenithal Point, or just the Zenith for short. The Zenith is the best spot to image the sky, as the atmosphere is thinnest there (line of sight…look strait up, you look through less atmosphere in total than if you look towards a horizon.) Throughout the summer, starting in May and ending only just a week ago in August, I managed to create images of four major regions within Cygnus, most of them within the large molecular cloud that fills most of the region. The first region I’ve shared today is the North American and Pelican nebula region. 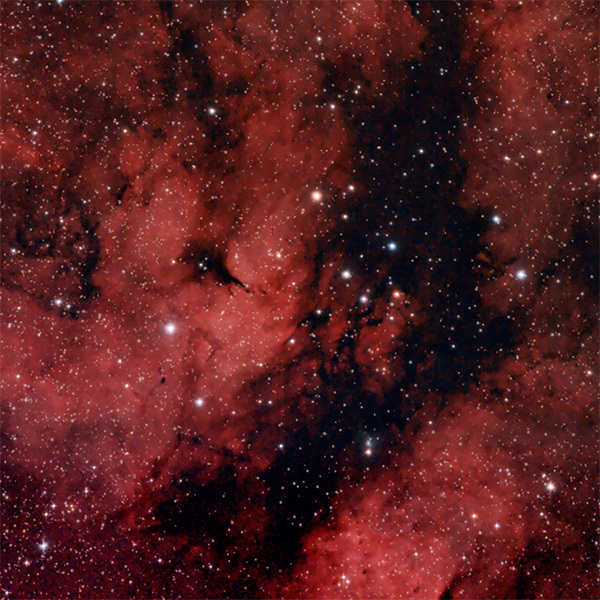 This region is probably the most recognizable of the nebula in Cygnus. 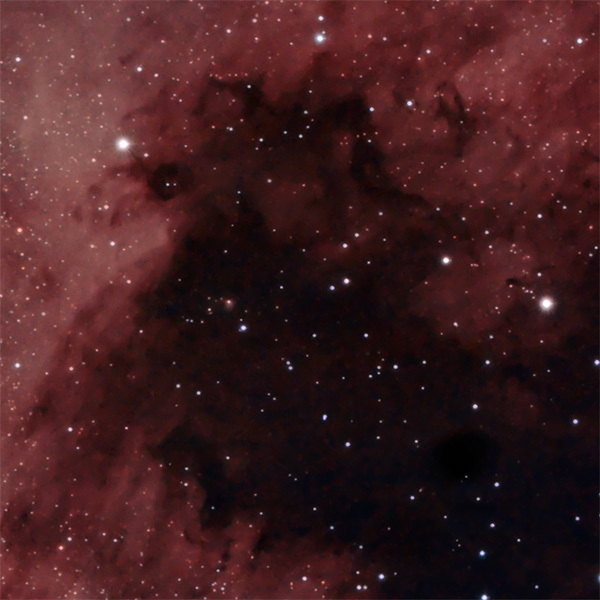 Separated by a dark nebula, a long, thick, nearly pitch black stretch of dust, North America nebula is to the left. 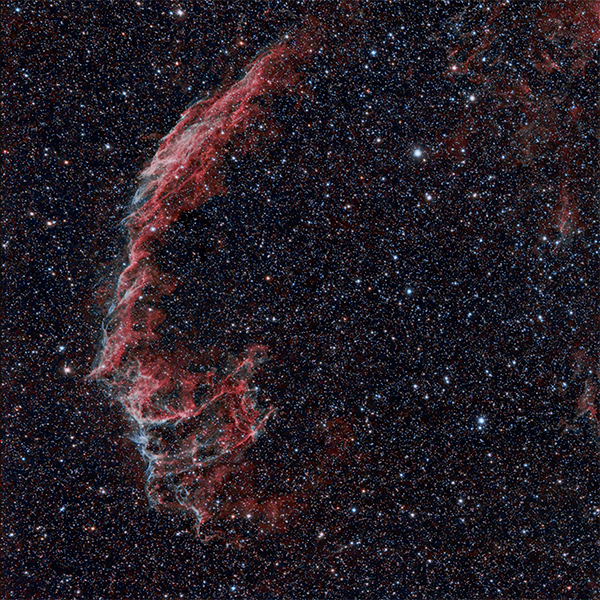 To the right of the dark lane next to North American nebula is Pelican nebula. 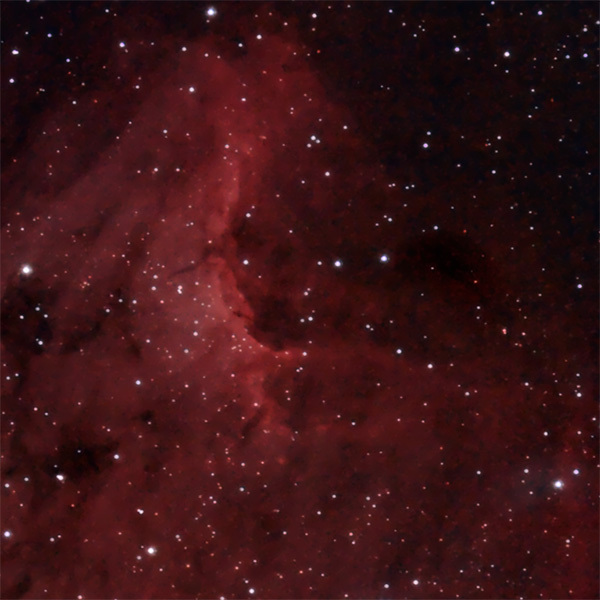 It usually takes a moment to recognize the shape out of the darker reddish nebula here, however the interesting nebulous structure imaged below forms the pelicans body. This region was one of the first I imaged. At the time, my skill was considerably less than it is now, and that shows in the overall results. In the future I have ambitions to create large mosaics of entire regions of the sky, such as the Cygnus and Orion molecular clouds. I hope to have even more advanced equipment sometime early next year, which should make it possible to resolve considerably more detail with less noise and “grit”. The primary structure of Crescent, as I’ve imaged here, is primarily intense hydrogen emission nebula, emitting a lot of light in the Ha, or Hydrogen-Alpha band. Surrounding, and partially intertwined with, this hydrogen emission nebula is also an oxygen emission nebula, that emits primarily in the OIII or Oxygen-3 band. The oxygen part of Crescent is much fainter, and any light for it is usually obliterated when imaging within the city (as I do). Despite the challenges, if you examine the above crop closely, you can very faintly see a grayish-blue shell around the brighter red structures of Crescent. It took the bulk of the summer to gather the necessary data to render this image properly. I was regularly plagued by weather, which prevented my ability to image at all throughout most of the core summer months. When I did have a chance at a clear sky, I ran into several issues with my mount that reduced the amount of time I effectively had to image this region even further. In the end, I was able to get enough data to render both the Crescent itself, as well as a fair amount of the background emission nebula. Needless to say, imaging crescent in significantly more detail, with narrow band filters for the Ha and OIII bands, is a top goal once I acquire more sensitive and capable camera equipment, and a larger telescope. 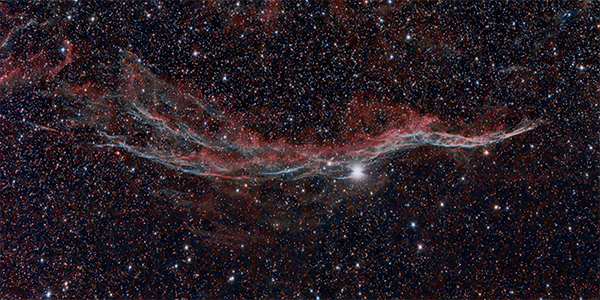 Personally, I think Veil nebula is one of the more amazing objects in the night summer night sky. It’s extensive, yet delicate and almost lace-like structures are both stunningly beautiful and incredibly intriguing. The depth of detail in this one area of space is extreme, and one could spend an entire summer doing nothing but imaging the various different parts of it’s vast structure. More to look forward to in the future, especially once I acquire some imaging equipment that will allow me to do narrow band exposures, which will allow much deeper, more detailed imaging even under my heavily light polluted skies. While that is all I have for today, it’s not the last of my astrophotography for the summer. I imaged other objects, some of which I have just about completed, some of which still need more exposure. The summer sky is beginning to wane, and within a month the winter constellations will be above the horizon before twilight. It feels a little strange. I’ve only been doing astrophotography for six months, almost exactly (couple weeks longer), and I started with the same constellations that I now see rising in the early morning as I pack up my imaging gear. The first regions of the sky that I imaged were in Orion…the Orion and Horse Head nebulas. Even before picking up my astrophotography equipment, I had started trying to image Orion and Running Man nebulas with the standard photography equipment I had (no tracking) about this time last year. So in a sense, it has been one full year since I first got serious about astrophotography. Back then, I truly had no idea what I was doing. This time, I’ll be going into fall and winter from the get-go with significantly more skill. Hopefully I’ll be able to capture more detail on Orion and Horse Head nebulas, as well as get some quality clear, dark sky time on some of the other interesting structure within Orion, Monoceros, Gemini, Pleiades, and the other winter constellations. So, stay tuned. Lots more to come!